AXLE SUPPORT STAND Large 14"-21.5"
Heavy duty support stands large 14" to 21.5" screw adjustment. All our Axle stands are NCC code of practice 501 approved. 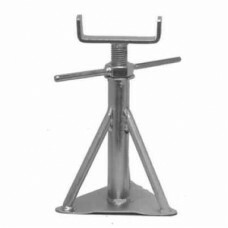 These stands are fully tested and a Certificate of Conformity is available on request. For homes up to 8 metres in length there should be a minimum of 2 support points on each longitudinal member (in addition to those either side of the axle support area). For homes between 8 & 12.2 metres in length there should be a minimum of 4 support points on each longitudinal member (in addition to those either side of the axle support area). For homes over 12.2 metres and up to the maximum legal length of 20.00 metres there should be a minimum of 6 support points on each longitudinal member (in addition to those either side of the axle support area).